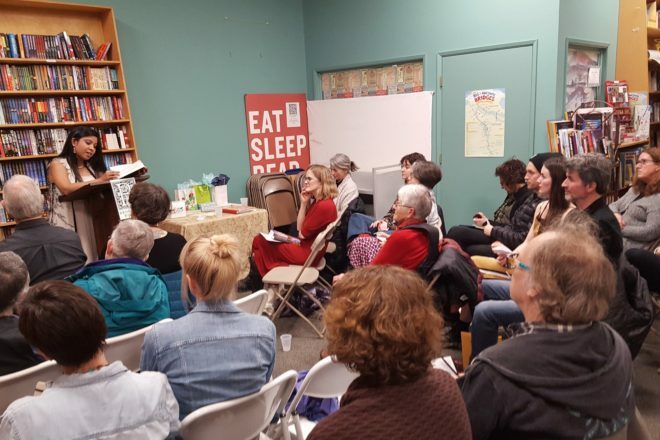 Dr. Debotri Dhar at a Hummingbird Global Writers’ Circle event at Broadway Books in Portland, Ore. Submitted. 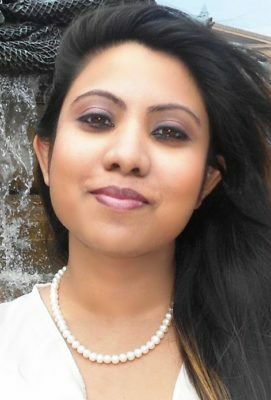 Write On, Door County will host an intimate writers’ circle with writer-in-residence Dr. Debotri Dhar in partnership with her international reading series, Hummingbird Global Writers’ Circle. An evening of readings, discussion and new friendships will ensue at one of Write On’s many acres of orchards and meadows. The Hummingbird series aims to bring different communities together in different parts of the world with hopes of creating an exchange of cultural knowledge and understanding between participants. The writers’ circles are themed, the Door County event being “water,” inspired by the Celebrate Water initiative. The idea behind this event is that writers at different levels and stages of progress will share their work for an audience, paired with a discussion led by Dhar regarding craft, publication, etc. Dhar is “woman, writer, traveler.” She is the author of many works, both critical and creative. Her areas of study are far and wide, from gender, race and representation to love to sexual violence. An interest in women and literature globally, as well as gender violence and the state, has continued to be a major focus, she said. “My work as an academic is transdisciplinary, straddling the humanities and social sciences, with an enduring emphasis on gender issues,” said Dhar, who is on the faculty of the University of Michigan Department of Women’s Studies. Balancing the critical and creative is very important, she said, especially for critical theorists and literary critics. Creating new ideas and spaces rather than just critiquing them is necessary, she said. Dhar started writing creatively in Bangla as a young child, and later began to write in other languages including Hindi and English, she said. Creative writing and reading were a way for her to explore the world before she started to actually travel. Now she’s published two novels as well as short stories, and has several new books on the way. Travel is a major theme in her work – she creates women travelers from India, America and elsewhere as main characters in an effort to counteract the historically male traveler, she said. “I also like to mix in multiple languages and craft hybrid universes, where latitudes shift, cultures collide, and the world is a rainbow of colors,” Dhar said. After publishing her first couple books, Dhar began to question what “good writing” means today and whether it’s necessary for books to sell, even as writers have more of an expectation to market their own work, she said. That’s where the idea for her writer’s circle began to form – a need for free spaces where writers could discuss writing and share from their work, improve it and showcase it, she said. A hummingbird felt like a natural name for it, she said. “The ‘writer as hummingbird’ knows that tiny wings are better than none at all, and flies in search of a few drops of nectar, sunlight, soil and a little bit of sky,” Dhar said. Attend the Hummingbird Global Writers’ Circle at Write On, Door County, 4177 Juddville Road, for inspiration and discussion June 12 from 5-7 pm.